PM says vote on official approval of town was delayed 'for tactical reasons,' but promises to address issue in government meeting next week. A number of Likud ministers demanded at the Likud faction meeting this morning, Sunday, that a vote to approve the community of Havat Gilad be placed on the agenda of the government’s next weekly meeting, after the Prime Minister failed to bring up the issue at today’s meeting. Arutz Sheva has been told that at the closed meeting, Culture Minister Miri Regev brought up the issue first, and that she was joined by Tourism Minister Yariv Levin, Environmental Protection Minister Zeev Elkin and Welfare Minister Haim Katz. In response, Prime Minister Netanyahu asserted that the delay in raising the issue of Havat Gilad was the result of “tactical reasons,” and that the issue will be brought up at next week’s meeting, in conjunction Defense Minister Liberman, who has formulated a proposal to normalize the community. 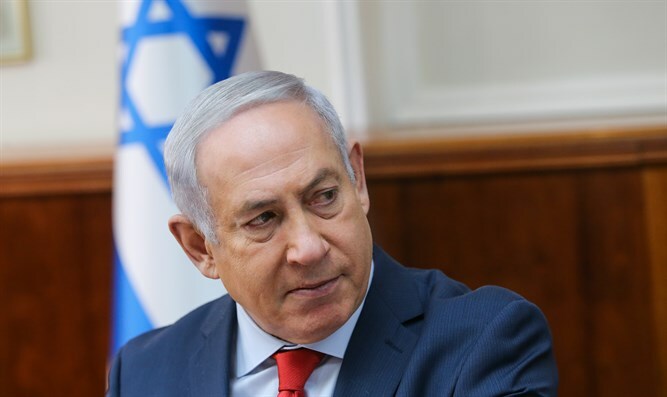 Netanyahu added that those critical of the delay in a vote on the matter of Havat Gilad know that the issue will be addressed next week, and are simply attempting to present the raising of the issue as their own achievement. Yesterday, residents of Havat Gilad expressed their disappointment at the Prime Minister’s refusal to advance steps towards official approval of the community. "It's unbelievable," founder Itai Zar said. "Almost every government minister was here, and they all promised to push the issue forward. Defense Minister Avigdor Liberman (Yisrael Beytenu) offered suggestions on the issue. We really feel like the government is dragging its feet." “I call on the Prime Minister to immediately approve Havat Gilad. 'The blood of your brother is crying out to you from the earth' (a quote from the story of Cain and Abel, ed.). There needs to be a response to this murder. There needs to be a response to the terror and the pain. This is the response we are requesting." Havat Gilad was founded 15 years ago, on land legally purchased and privately owned by Moshe Zar, but did not obtain official Interior Ministry recognition as a Judea and Samaria community. Havat Gilad resident Rabbi Raziel Shevach, 35, was murdered on January 9 in a terror attack near his hometown. He is survived by his wife and six children, the youngest of whom is ten months old.